Rubin’s accomplishments during her nearly five decades in Santa Barbara are beyond calculation. This article was originally published by the weekly Santa Barbara Independent and is reposted here with permission. The last time I saw Selma Rubin was maybe a month ago. She was recovering from an operation at the Val Verde Retirement Home. When we got through sharing political gossip – as usual she knew way more than I did – I gave her strict instructions not to go dying on me. She only had three years to go before hitting 100, a party I knew she wanted to celebrate. But mostly, I told her, I didn’t want to write her obituary. It would be too hard to imagine Santa Barbara without her. Apparently, she wasn’t listening. Late last week, Selma died just a few weeks shy of her 97th birthday. In the shorthand of political caricature, Selma was the little old lady with gaudy window-pane sized eyeglasses and a collection of hats that refused to quit. And in the 47 years Selma called Santa Barbara home, she made it her personal mission to be everywhere, all the time. Or so it seemed. If you went to a concert at UCSB, Selma was there. If there was a speech at the Faulkner Gallery, she was there. And if there was political action afoot, especially of the progressive left-wing variety, most likely Selma helped organize it. That’s been Selma’s way when she first moved to Santa Barbara with her husband Bill in 1964. And it stayed that way until late last year when lung cancer slowed her down. Selma’s accomplishments during her nearly five decades in Santa Barbara are beyond calculation. 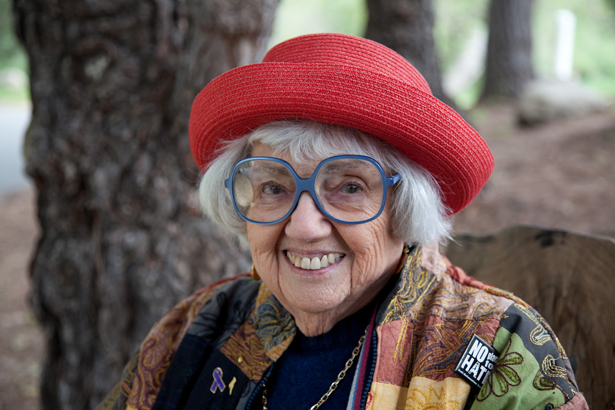 She helped start 42 grass roots political organizations dedicated, in various ways, to preserving the environment and promoting social justice. Many of these organizations have since faded from the scene, their purposes served. But, to a startling degree, many remain very much alive, engaged, and formidable – and so established they’ve become enshrined in the institutional alphabet soup that defines the South Coast left: the Environmental Defense Center (EDC), the Community Environmental Council (CEC), the ACLU, SBCAN, and the Fund for Santa Barbara among them. Taken in their totality, the organizations Selma nurtured effectively re-defined the range of political debate in Santa Barbara. It’s worth remembering that values now taken for granted as safe and inevitable – like the preservation of open space – were not just improbable when Selma started, but positively dangerous. And Selma didn’t just change the political landscape. In ways dramatic, enduring, and very tangible, she – and the organizations she fostered – left an indelible mark on the physical landscape itself, beating back repeated efforts to industrialize the coast with offshore oil development, or to commercialize it with massive sprawling development. The most glaring case in point involved well-oiled plans by out-of-town developer Jules Berman to construct no less than 1,535 new houses along the Gaviota Coast, near El Capitan, back in 1970. The County Planning Commission approved and so did the Santa Barbara Board of Supervisors. There was no Coastal Commission to appeal to; it didn’t exist yet. There wasn’t even a California Environmental Quality Act to sue over; that didn’t exist either. Selma Rubin, then 55, along with her friend Anna Laura Myers, responded by launching a petition drive to put the proposal on the ballot. They needed 9,000 signatures; they collected 12,000. When it went to the voters, Berman’s proposal was rejected by a margin of two to one. District Attorney David Minier, then tight with powerful real estate interests, filed criminal charges against Rubin and Myers, alleging they forged some signatures and tampered with others. If convicted, the two women faced a maximum of 28 years behind bars. Selma would later recall how frightened she was. But her friends remember her also being gleeful: Minier had played right into Selma’s hands. She made the court case a rallying cry for Santa Barbara’s emerging environmental movement. Selma hired attorneys Frank Sarguis and Stan Roden to defend her, and they battled it out in an intensely publicized, two-week preliminary hearing with a prosecutor who, it turned out, was ashamed to have been assigned the case. In the end, Judge Jack Rickard – a rock-ribbed Republican appointed to the bench by then-Governor Ronald Reagan – tossed out the charges, making clear his disgust that they were ever filed. Later, Minier’s association with real estate developers implicated in numerous arson schemes proved his political undoing. And one of Selma’s defense attorneys, Roden, pushed Minier out of office in one of the county’s most hotly contested DA’s races ever. In this regard, Selma called herself the “Jimmy Higgins” of any group, the worker-bee who filled the needs as they came up. A professional book-keeper by trade, Selma served as treasurer for countless nonprofits over the years, providing them a level of fiscal sanity and stability essential for long-term survival, growth, and evolution. It helped that Selma had some money of her own – a few million dollars – which she took delight in giving away. More than that, she knew other people with serious money looking for causes to invest in. In the eyes of these donors, Selma’s mere presence boosted an organization’s credibility ten-fold. Those who wound up on Selma’s bad side found themselves living on the dark side of a very cold moon. But if you kept your word with Selma, she proved a powerful ally and fiercely loyal friend. She liked to talk, but she was also a gifted listener. She wasn’t pious or politically correct. She enjoyed the company of misfits and malcontents given to venomous diatribes against people and organizations she held dear as long as they had something to contribute. She liked to laugh and relished the rich details of life’s messy melodramas. She understood that the personal and the political were inextricable. She seemed to know everybody, and up to the very end, she remembered everything. Her vast institutional memory – what had been tried before, who wasn’t talking to whom – proved priceless for the organizations with which she served. Selma had a keen eye for talent, the ability to distinguish between mere enthusiasm and actual ability. And despite her reputation for gruffness, Selma took infectious delight in the fresh energy of youth. She pushed, prodded, taught, cajoled, scolded, joked, and encouraged. No job was beneath her, and absolutely no one worked harder. She taught by doing. The irony is that when Selma moved to Santa Barbara from Los Angeles in 1964 with her Bill, they planned to retire from what had already been a full life of political activism. Selma grew up one of three kids in Toledo, Ohio. Her father, a Ukrainian Jew, had immigrated to the United States in 1901. He owned a music store and a string of five-and-dimes. When socialist Eugene Debs ran for president in 1912, Selma’s father enthusiastically supported him. Selma learned the book-keeping skills that would later distinguish her by working in the family businesses. During World War II, she served in the Navy, and afterward moved to Los Angeles with Alex Elber, her first husband. When Elber died in the 1950s, she married Bill Rubin, a gifted engineer who not only designed the water system at Dodger Stadium but designed the iconic Van de Kamp bakery sign. By 1964, Bill’s health was deteriorating. His lungs couldn’t handle the smog, so the couple moved to Santa Barbara. The idea was to give politics a rest. “Just relax, pretend we’re on vacation,” Selma explained. Three weeks after the Rubins moved to town, a black couple stopped by for an overnight visit. Their arrival was noted by the driver of a pick-up truck, who slowed down to conspicuously rubber-neck as the couple unpacked their bags in front of the Rubin’s home. A few days later, the Rubins woke up to discover every tire on their two cars slashed. Selma looked at Bill. Bill looked at Selma. “Vacation’s over,” they both agreed. Bill Rubin would die after a long, cruel struggle with Alzheimer’s that robbed him of the brilliant intellect that won Selma over on their second date. Instead of his retreating into an isolated convalescence, Selma took Bill, prone to wandering, with her everywhere. Alzheimer’s would be a new cause, one which united her with the likes of Nancy Reagan, and she never stopped. Two years ago, Selma was presented a lifetime “Endurance Award” by Get Oil Out at the organization’s 40th anniversary celebration. (She almost didn’t get it. The presentation was delayed till nearly midnight after Goleta City Council member Ed Easton fainted and an ambulance was called.) Selma was asked at the podium the secret of her long career. Grabbing the mic, she boiled it down to two simple words. “Stay active,” she said, and then sat down. A memorial celebration will be held for Selma Rubin sometime in late April or early May. In lieu of flowers, please send donations to the Selma Rubin Fund now being established by the Fund for Santa Barbara. Nick WelshNick Welsh is a longtime reporter for The Santa Barbara Independent, where he manages to pound out a relentless stream of news articles every week on a wide range of subjects. In addition, he writes the Angry Poodle column.